For every East Village business that’s opening or closing, dozens are quietly making it. Here’s one of them: Archangel Antiques. After twenty years, Richard Cullen and Gail Busche, the couple that runs Archangel Antiques, may be coming to the end of their time at 334 East Ninth Street. The culprit, as you might have guessed, is rent. “When we first moved in it was like $800 a month,” said Mr. Cullen. “Now it’s close to $4,800 and it’s going to go up on the next lease – easily. So, we are thinking of retiring when the lease is up. By then we will be in our 70s and probably won’t want to sign another lease. 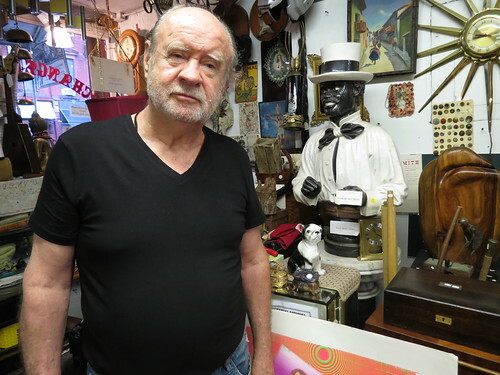 We’ll be looking to sell the business.” We spoke with Mr. Cullen about the quirky antiques emporium and who they might want to hand it off to down the road. You have two stores in one. How does that work? One is west and the other east. They are both about 10-by-30. There are oddities on the east side of the store, which is the side I run. I say “home furnishings.” I have a stuffed hawk, stuffed iguanas, and all kinds of old, odd creatures. On the west side is the antique buttons and cuff links, vintage eyewear, the vintage jewelry and clothing that my partner Gail runs with Michael who manages that side of the store and has been with us for 18 years. The wacky stuff we get is endless, but we keep things neat and clean. I just sold a stunning marble bust of a Mississippi riverboat croupier. What’s been the secret to the three of you getting along all these years? We like what we’re doing. We like waiting on people. We treat people like human beings. Believe me if we wanted to be millionaires, we’d be doing something else. We all enjoy what we are do and our roles in the stores. Gail and I have been doing this for 35 years. Before we got together we were doing antique shows. I met her at one where we both had booths and we’ve worked together since as a couple and partners. It all balances out. We pretty much bring in the same. Sometimes they are busier, sometimes I am. What kind of requests do you typically get? I got a telephone call from someone in Santa Monica calling about two antique typewriters for a celebrity I can’t name. They are classic typewriters so more expensive. They are classic typewriters so a couple hundred dollars each. A woman came in recently and bought a beautiful umbrella from the 1900s that was $95. I just sold a beautiful buckle from the 1880s for about $100. It was 120-years-old. You’d find it for $300 on Madison or Park Avenue. At Ralph Lauren for $500. Why are you charging so much less? It’s a good way to build a business to be fair and not charge too much. We try to be reasonable. Some stores have a certain panache and a rent structure so they have to charge more. We charge a fifth of what others charge. We have a different customer base, but sell the same stuff. For example, I sold a beautiful suitcase from the 1930s for $30 because the guy had no money. Young kids, students have no money unless they’re rich kids. I have great compassion because I was there once. When I was young in the East Village, in 1965 my first rent was $50, then $67 and $87. My first nice one was with one fireplace for $115 right here in the East Village. The next one had two nice working fireplaces for $125! That’s how much times have changed. We buy from Maine to Florida. We travel and visit dealers all over the East Coast. I always go into the larger antique places and hand pick from them. Michael buys really nice fashionable, high-end stuff too. What type of people would you like to sell this business to? A younger couple who can do the social network things like Facebook and Twitter that we should have been doing all along. Someone less focused on the brick and mortar stuff since the rent is so high. We want a couple to pursue online sales, e-commerce. It would have to be people who want to deal in vintage and antique items, but then be into the Internet end of things and want to develop that part of the business. We have a website address but we need it to be developed. Even though it’s not us, we would wholeheartedly expect them to go in that direction and develop the business from a modern point of view. We just did it gradually over 20 years in a very laid-back way because costs were so much less. We never advertised or marketed. I think we would want to sell to an aggressive couple who will do what we should have done, but didn’t want to do. We always say we are the most unimportant store in Manhattan, but we’re full of character. What are two cool things that you just can’t seem to get rid of? I have an alien form an early “Roswell” movie. He’s about five feet tall and he is from California, from the studios. He’s made out of rubber and is probably now about 60 years old. I’m selling it for $700. People love it, but no one wants to buy it. Everyone says, ‘Oh, my god! What is that?’ That’s why I bought it. I also have a wood carved table that is very unique. It’s with an elephant on the bottom and the tabletop is in the shape of Africa resting on the elephant’s back. I’m selling that for $400. What have been your good and bad years? When the towers fell it was very hard. Business dropped dramatically, same with the Internet bubble bursting when all those young people lost their jobs. A lot of people stopped coming then. We’re lucky we’ve lasted.